A: Rosacea is a chronic, inflammatory skin condition that affects adults. It causes redness in your face and produces small, red, pus-filled bumps. A: Symptoms include facial flushing, redness, burning, red bumps, and cysts—particularly on the forehead, cheeks, nose, and chin. These symptoms tend to come and go. The skin may be clear for weeks, months, or years and then erupt again. A: Although the cause of rosacea is not known, it’s likely due to a combination of hereditary and environmental factors. 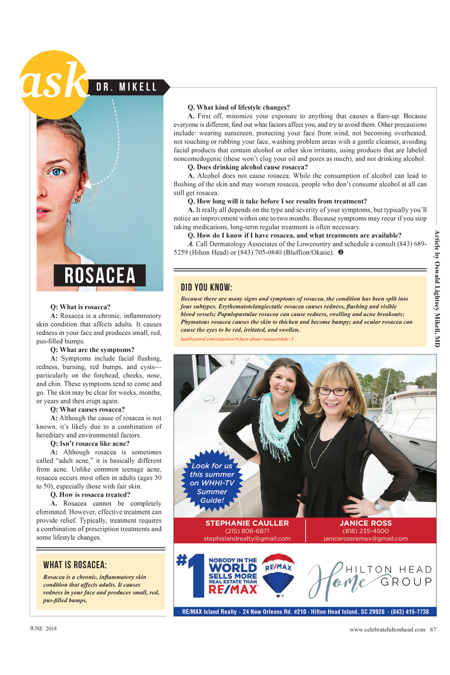 Q: Isn’t rosacea like acne? A: Although rosacea is sometimes called “adult acne,” it is basically different from acne. Unlike common teenage acne, rosacea occurs most often in adults (ages 30 to 50), especially those with fair skin. A. Rosacea cannot be completely eliminated. However, effective treatment can provide relief. Typically, treatment requires a combination of prescription treatments and some lifestyle changes. Q.What kind of lifestyle changes? A. First off, minimize your exposure to anything that causes a flare-up. Because everyone is different, find out what factors affect you, and try to avoid them. Other precautions include: wearing sunscreen, protecting your face from wind, not becoming overheated, not touching or rubbing your face, washing problem areas with a gentle cleanser, avoiding facial products that contain alcohol or other skin irritants, using products that are labeled noncomedogenic (these won’t clog your oil and pores as much), and not drinking alcohol. Q. Does drinking alcohol cause rosacea? A. Alcohol does not cause rosacea. While the consumption of alcohol can lead to flushing of the skin and may worsen rosacea, people who don’t consume alcohol at all can still get rosacea. Q. How long will it take before I see results from treatment? A. It really all depends on the type and severity of your symptoms, but typically you’ll notice an improvement within one to two months. Because symptoms may recur if you stop taking medications, long-term regular treatment is often necessary. Q. How do I know if I have rosacea, and what treatments are available? A. Call Dermatology Associates of the Lowcountry and schedule a consult (843) 689-5259 (Hilton Head) or (843) 705-0840 (Bluffton/Okatie).